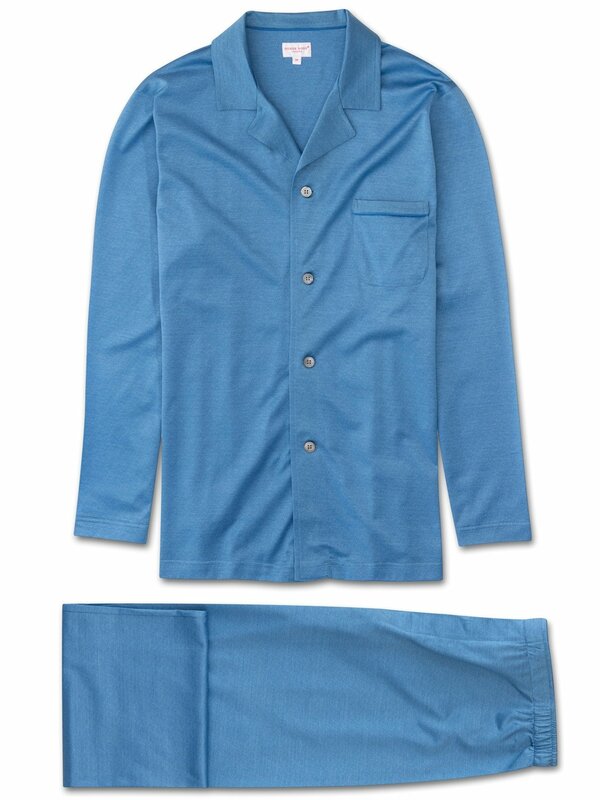 Our men's modern fit jersey Bari 14 light blue pajamas have been designed for a streamlined look by removing the pant drawcord and creating a half-flat front with elastication at the back and sides of the pants. This prevents bunching of the waistband fabric at the front. The Bari 14 pants also feature our self-seeking magnetic fly closure. A hidden blessing to every man, this simple but revolutionary feature allows easy opening and hassle-free closure of the fly. To finish the refined look, the jacket has discreet stitching, a flat and open collar and mother of pearl buttons throughout. Knitted from pure Filo di Scozia cotton, the Bari 14's greatest strength is its versatility. 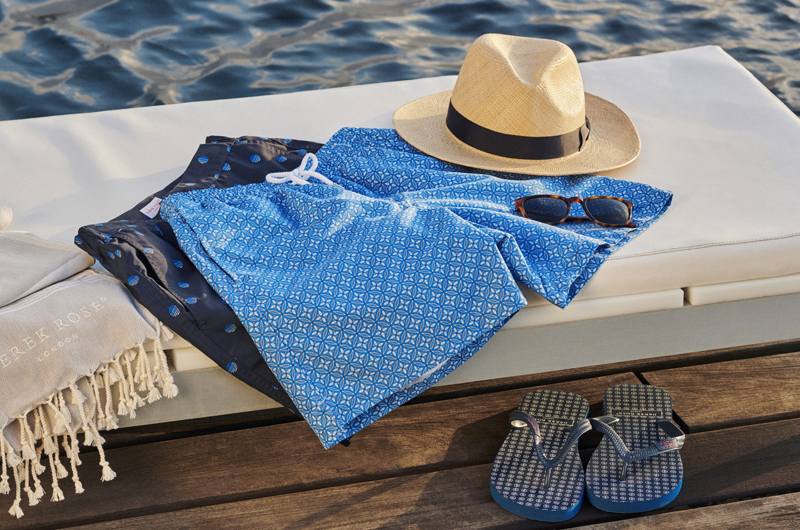 The light yet strong fabric is ideal for travel, as it folds down efficiently and weighs little and it excels in both cold and warm climates. The jacket can also be worn outside over a t-shirt for a smart-casual look. Filo di Scozia is not like every other cotton fabric. Produced exclusively from extra-long staple cotton, the resulting yarn is durable and already naturally shiny. It then goes through a process of double mercerisation, where stray fibres are removed and the yarn is smoothed to create a uniform appearance. This also enhances the natural shine of the yarn and gives it a resistance to pilling. In addition to this, mercerisation gives the yarn better absorption qualities and reduces shrinkage. But most importantly, the smoothness of the yarn makes for sumptuously soft fabric; and this softness lasts. Wash after wash, our Bari 14 pajamas retain their exquisite comfort and elegant sheen. Filo di Scozia is also suitable for allergy sufferers and is such a fine yarn that it is ideal for daily contact with even the most delicate skin. We achieve the natural stretch that makes our Bari 14 pajamas so comfortable by creating a fine gauge jersey, rather than a traditional woven cotton fabric. This fabric is knitted into existence in Italy, on a circular machine, to create a cloth with an innate stretchiness – without the need of another fiber such as elastane. So, as you turn over in your sleep, or curl up on the sofa, all you feel is the softness of truly luxurious cotton. If you want stretchy but still extremely high-quality, then the Bari 14 is for you.